Enjoying a glass of fine wine by the fireside is as normal a part of a Holiday party as passed hors-d’oeuvres. But at this time of year, it’s wise to be well aware of the scientific community’s numerous studies on the association between alcohol consumption and cancer. The National Institute on Alcohol Abuse and Alcoholism (NIAAA) sets a maximum of 14 drinks for men and seven for women within a week’s time. Within these limits, medical publications have noted that there may be some actual health benefits from the consumption of alcohol in moderation, such as staving off stroke, dementia, and depression. There too have been studies demonstrating that those who consume red wine in moderation are at a 50% lower risk of developing bowel tumors. Also, a Cedars-Sinai of Los Angeles study published in the Journal of Women’s Health links chemicals present in the seeds and skin of red wine grapes with a diminished risk of breast cancer among premenopausal women. Moderate or occasional consumption of alcohol, in particular, red wine, has also been seen to boost beneficial omega-3 fatty acids in the blood. But science pointing to cancer mitigating effects associated with alcohol consumption must also be squared with abundant studies of increased risk. The National Cancer Institute(NCI) provides a cavalcade of information on studies which show concrete causal links between alcohol consumption and cancer diagnosis. Indeed, its “Report on Carcinogens” lists alcohol as a known cancer-causing agent, as does the U.S. Department of Health and Human Services’ National Toxicology Program. According to this research, as of 2009, 3.5% of all cancer deaths in the U.S. were related to alcohol. Cancers of the head and neck: major risk for those who consume 50g (grams) (3.5 drinks) or more per day. Liver cancer: alcohol consumption is viewed as a primary cause. Cancer of the esophagus: a major risk factor in cases of squamous cell carcinoma and those born with a deficiency in the enzyme which breaks down alcohol. Breast cancer: extensive studies show a hard link. 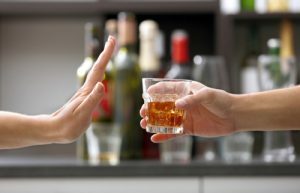 A study spanning almost 60,000 women shows those who drank greater than 45g daily increased their risk 1.5 times over non-drinkers, and the risk of breast cancer was elevated across all levels of alcohol consumption. Colorectal cancer: a moderate increase in risk for those consuming 50g or more per day. With respect to alcohol’s causal relationship with cancer, it is incumbent upon each adult individual to make wise and informed choices on their consumption. As we enter into a season of celebration and merriment, whether or not the eggnog is spiked or not is each person’s choice. Though moderation should certainly serve as a basic guiding principle.